Badfish Roller Derby Double Header! Double the HITS and Double the FALLS!! Join us July 9th Sat for our most explosive bout of the year! Get 2 bouts for the Price of 1. Up first for the night – Game 1, Drive-By City Rollers (All Mens Team) battling it out against each other in a black and white home team bout. If you have never seen Men’s Roller Derby, then you are in for a HUGE treat!! Game 2, Badfish Roller Derby Vs Border City Roller Girls in a re-match for bragging rights. Border City will be headed to California to try and claim a victory against Badfish’s All Star team after being defeated by Badfish in January. 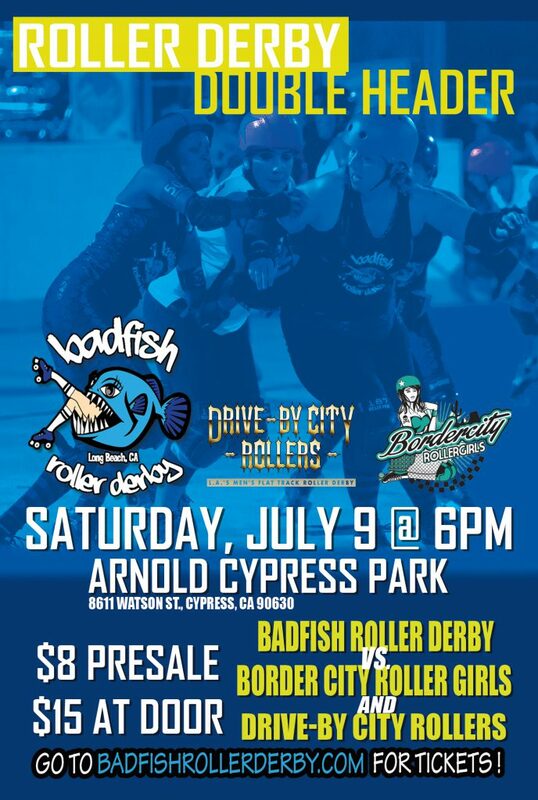 Badfish Roller Derby’s events are for ALL AGES and are action packed! Family Friendly. Discounted tickets only available online at http://www.brownpapertickets.com/event/2565677 till 11:30pm on 07/08/16, after that tickets can only be purchased at the door.